The UCI Libraries' 50th Anniversary Fall exhibit, Ready, Set, ZOT! 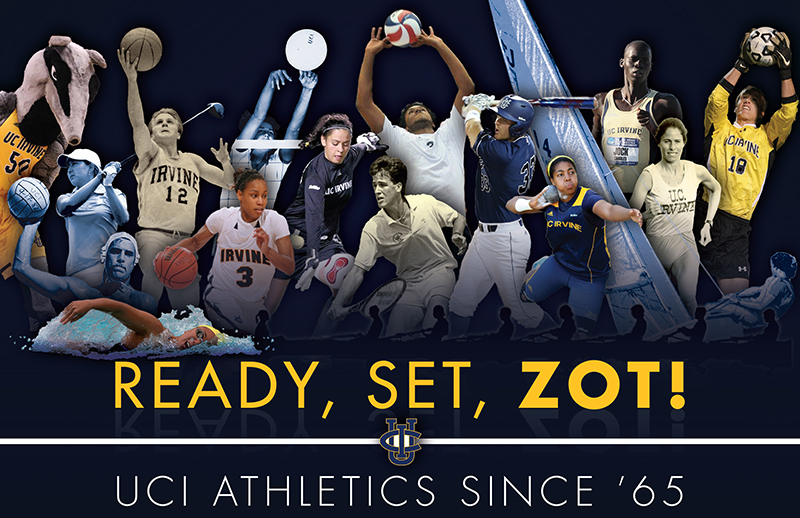 : UCI Athletics Since 1965, documents the dedication to excellence, commitment to success, and perseverance in the face of adversity that built today’s UCI ‘Eater Nation. It chronicles UCI sports history, and tells the story of how a young campus achieved such impressive results through rare photographs, archival documents, and items from the UCI Athletics Department. Exhibit visitors will experience the inspiring victories, improbable come-backs, heart-breaking losses, conference and national championships, and the incredible school spirit that made it all possible. Ready, Set, ZOT! : UCI Athletics Since '65 was curated by Head of Education and Outreach Catherine Palmer and Archivist for University Archives Laura Uglean Jackson. The exhibit was on display from September 2015 to April 2016 in the Langson Library Muriel Ansley Reynolds Gallery during regular library hours. To introduce this new exhibit, UCI Libraries held an opening night event on Monday, September 28th, in the UCI Crystal Cove Auditorium and Langson Library. The event was free and open to the public. Guest panel speakers included Russ Turner, UCI Men's Basketball, Head Coach, Julie Brooks, UCI Women's Golf, Head Coach, Dan Klatt, UCI Women's Water Polo, Head Coach, and Mike Gillespie, UCI Men's Baseball, Head Coach. Mike O'Sullivan, UCI Athletics Sportscaster, moderated this dynamic panel. Last season, Russ Turner led the UCI men's basketball team to its first NCAA Division I Tournament as the Anteaters won the Big West Conference Tournament for the first time in school history. Julie Brooks, the second head coach in history of the UCI women's golf program, has led her teams to two Big West titles, a NCAA Championship appearance in 2007 and 2009, and has mentored two All-Americans. Entering his 12th season as head coach for the UCI women's water polo team, Dan Klatt is known for his guidance with the 2015 Anteaters in their fifth place finish at the NCAA Tournament and No. 5 final national ranking, the program’s highest mark. Finally, Mike Gillespie has kept UCI among the nation’s elite men's baseball teams with over 1,000 Division I career wins and five trips to the NCAA postseason. The program was followed by a light reception and exhibit viewing. For further information on the exhibit or opening night event, please call 949.824.4651 or email partners@uci.edu. To support the Libraries' Collection Enhancement Fund, please go to: http://www.uadv.uci.edu/CollectionEnhancementFund.